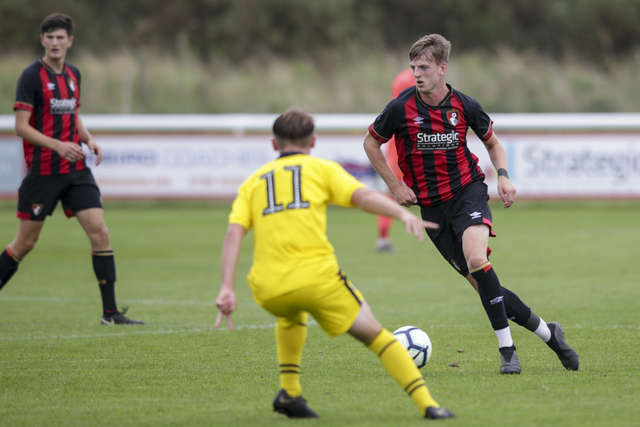 Goals from Christian Saydee, Tom Hanfrey and Zeno Ibsen Rossi extended AFC Bournemouth under-18s unbeaten league run to 12 with a 5-0 win over Swindon Town under-18s on Saturday. Five first half goals, courtesy of two set-pieces from Hanfrey, two strikes from Saydee, and one from Ibsen Rossi made the victory comfortable, with the second-half becoming focused on keeping a clean sheet. Alan Connell’s side have found set-pieces to be a fruitful source of goals over recent weeks, both strikes last weekend coming from corners against Portsmouth. That proved to be the case again early on, Hanfrey fooling the wall and the ‘keeper with a low free-kick creeping in at the near post 11 minutes in to put the Cherries 1-0 up. Before Swindon had the chance to respond, the relentless Cherries were hungry for more, finding their second just two minutes later. After Tom Dinsmore closed the angle to cut out Samuel Smith’s passing lanes, the Swindon ‘keeper’s clearance went straight to Saydee. The forward, taking time to run himself into a clear goal-scoring position, found the bottom-left corner comfortably. Saydee’s second again came from the work of his midfielders behind him, with Luke Nippard’s first time strike from distance presenting a rebound to Saydee after Smith had got down low to save well. The striker made no mistake from close range, giving Bournemouth the 3-0 lead. The first half was all Bournemouth from start to finish, and the task became even more of an uphill challenge for Swindon when Hanfrey sent a corner in on the 33rd minute to Ibsen Rossi, the latter picking out the top right corner to put his side in cruise control. Not content with just the four first-half goals, Hanfrey netted his brace with a calm and composed penalty kick into the bottom-right corner, after Nathan Moriah-Welsh had been brought down in the box, wrapping up a faultless first half for Bournemouth. Swindon slowly began to grow into the game during the second half, but rarely saw their marginal increase in possession lead to any clear-cut chances. Toby Holland came closest for the away side as he saw a strike sail over the bar from the edge of the box in the 80th minute, but Bournemouth held firm during what was a quiet second period. The Cherries played some delightful football out from the back while under a high press from Swindon late on, stringing countless passes together to see out a convincing win with a dominant performance. Speaking to afcb.co.uk following the match, a satisfied under-18s manager Alan Connell had this to say on the following topics. “We showed everything that we work on every single day, so pressing from the front, moving the ball quickly and creating chances. It was almost a perfect 45 minutes in the first half with the build-up play, chances created and goals scored. “Going into half time 5-0 up, we had to make sure the players didn’t get complacent. In the second half, even though we didn’t score we were just as good on and off the ball. It was pleasing to keep the clean sheet because we’ve conceded too many goals recently. “Brennan has gone on loan to Poole Town so that he can play men’s football at a good level. He’ll still be with us as well, so it will be a good experience for him to get a taste of that level at a good club with people who we know and trust.